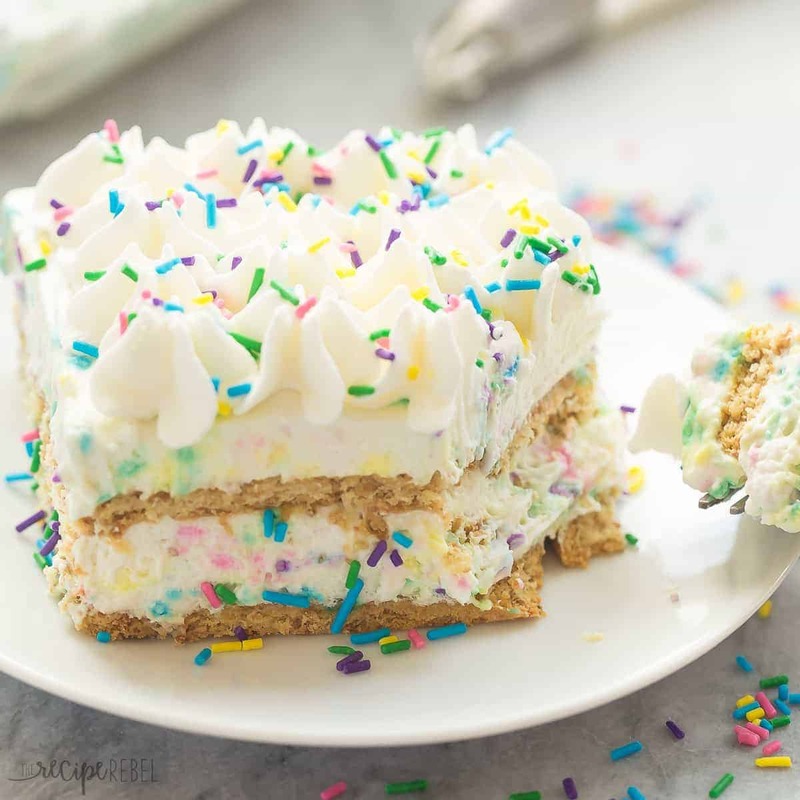 An easy, no bake icebox cake loaded with funfetti flavor! Only 10 MINUTES prep time and full of homemade cake batter flavor. Both of my girls love sprinkles. And it’s not like we have sprinkled things on a regular basis, but when we do, or when we see them… it’s a pretty big thing! I’m sure it’s scientifically proven that sprinkles make people happy. We all love bright, colorful things, right? And yes, most of the time here our brightly colored foods are in the form of fruits and veggies, but every once in a while, what’s the harm in a few sprinkles?? I love icebox cakes. No bake cookies. No bake desserts in general. They’re just hard to do wrong, you know? There’s no overbaking or underbaking — just a few simple ingredients that are thrown together in different ways with different flavor combinations. 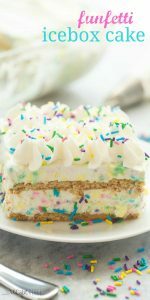 When I originally was planning to make this recipe, I thought I would simply mix some cake mix into whipped cream and add sprinkles. How else could you get that cake batter flavor? But when I opened my door to my secret cake mix stash, I just couldn’t do it. My goal is to bring you more recipes with real ingredients (and really, I feel like I do that 98% of the time already), and I figured cake mix is easily made from scratch. So I checked out some recipes, and really the only ingredients that I would add would be flour and sugar, since the leaveners are completely unnecessary in a no bake dessert. 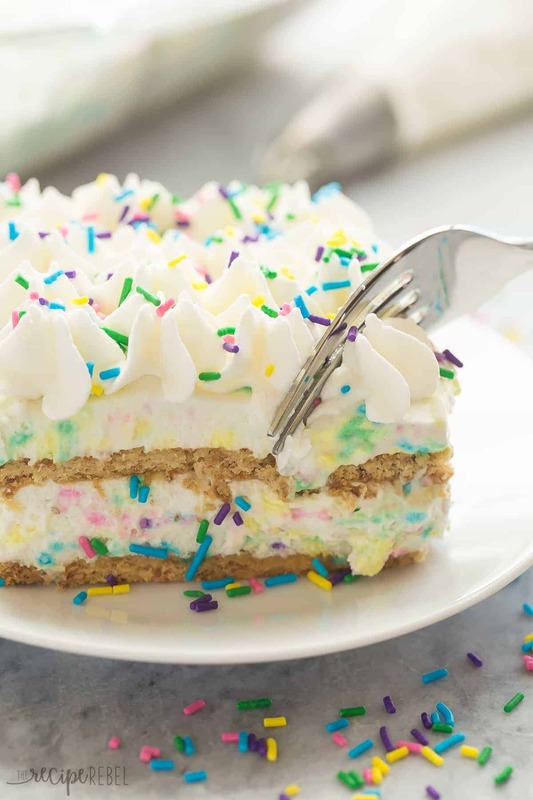 I decided to bump up the funfetti flavor with a good dose of vanilla, and added just a touch of flour for that cake mix flavor — it also helps to thicken the whipped cream. If you find that weird, it is so easily left out and will be just as delicious without. Line an 8x8" pan with half of the graham crackers, making one layer, not overlapping, breaking to fit if needed. In a large bowl, whip the cream until soft peaks form. Add the flour, sugar and vanilla and continue beating on high until stiff peaks form. Fold in sprinkles. Spread half of the whipped cream onto the graham crackers. Top with a second layer of graham crackers and spread with the remaining whipped cream. Cover with plastic wrap and refrigerate for 5-6 hours or overnight. Top with additional whipped cream and sprinkles if desired before serving. This cake can also be frozen completely and even served partly frozen! Line an 8×8″ pan with half of the graham crackers, making one layer, not overlapping, breaking to fit if needed. Didn’re work for me. Turned to liquid. What do you mean by “stiff peaks” exactly? Mixture got quite thick but no stiff in the way I imagined. It might be useful if you list approximate times for how long you’re supposed to keep beating. Hi Joe, I’m sorry you had problems! I’m not sure what you mean by “it turned to liquid”, since the cream is liquid when you start. You should continue beating until it looks like whipped cream — it should be fluffy and hold its shape when you scoop it. I had a grin ear to ear while reading this. Really looking forward to making this with the kiddos…thanks for sharing! You know I am a huge fan of this one! 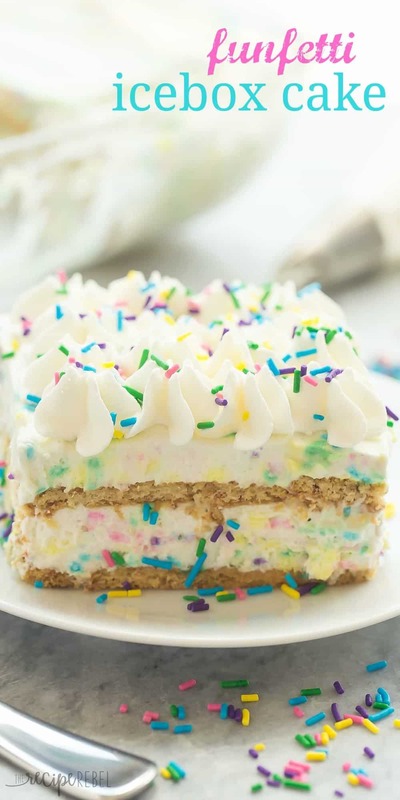 LOVE how fun and pretty this ice box cake looks!!! And your pictures are beautiful Ashley!! Girls and sprinkles just go together! 🙂 my girls would LOVE this icebox cake!!!!! yummm! What a gorgeous icebox cake, Ashley! I’m sure your girls LOVED this! I’ve never had a funfetti kind before, so I can only imagine how good this must taste. And I love how easy this is, too! Thanks Gayle! Easy is the name of the game these days!